"This is my jazzed up version of classic queso dip taken to a heartier level, perfect for football games, tailgating or for taking along to pot lucks in a slow cooker! This is a serious crowd-pleaser that is served hot as a dip, spooned over crisp tortilla chips nacho-style, or rolled up in a warm flour tortilla! The heat can be turned up or down with the addition of jalapenos to taste." Place the diced tomatoes, processed cheese, chicken meat, sour cream, green onion, taco seasoning, and jalapeno pepper into a slow cooker. Cook on High, stirring occasionally until the cheese has melted and the dip is hot, 1 to 2 hours. Stir in the black beans, and cook 15 more minutes to reheat. 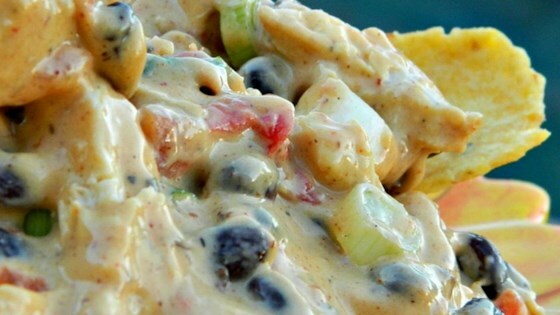 Cheese dip loaded with chicken, tomatoes, black beans and a zip of spice. If the dip gets too thick, thin with small amounts of milk. I would rather use real cheese and fresh ingredients instead of processed foods. Turned out to be very good. Delicious! I used 2 large cans of chicken to save time and didn't add any jalapenos. I think the jalapenos would add great flavor but my family cannot tolerate the heat!